***SELLER'S JOB FORCES RELOCATION***PRICED BELOW APPRAISAL***IN$TANT EQUITY!! ***2017 BRAND NEW CONSTRUCTION! ***SECOND FLOOR NEVER LIVED IN***WHY WAIT 6 MONTHS TO BUILD? ***SELLER ADDED OVER $10,000 IN UPGRADES: SCREENED LANAI, APPLIANCES, FANS, SEC SYSTEM, BLINDS & MORE***THIS HOME IS MOVE-IN READY with BUILDER'S WARRANTIES***EVERYTHING YOU WANT to MOVE UP and MOVE-IN***NO CDD Low HOA***PRIVATE & GATED 14 Home Exclusive Community. FIRST FLOOR OWNERS RETREAT w/ Large Walk-in Closet, Garden Tub & Separate Shower. Upgrades Include 18 Staggered 8x20 Tile & 94 Ceilings Throughout First Floor, Trey Ceiling & Crown Molding in Great Room. 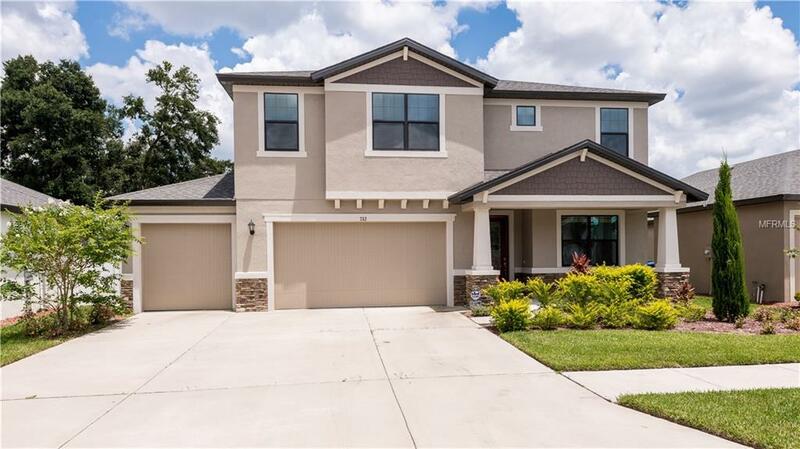 Kitchen has staggered 42 Espresso Cabinets w/ Crown Molding, Walk-in Pantry, an Enormous Upgraded Granite Center Island Overlooking the Great Room, Brand New Stainless Steel Appliances and Top of Line French Door Kenmore Refrigerator. Large Breakfast Nook has an Extended Bay Window. Covered Extended 22x14 Lanai has been NEWLY Screened (with Thick Privacy Screens). The backyard is partially Fenced w/ Ample Room to add a POOL! Irrigation Front & Back. Owner Added HOME AUTOMATION APP w/ SMART HOUSE FEATURES, SMARTPHONE MONITORING, CCTV Security System w/ 4 Exterior Cameras and Much More! Also Decorative Glass Front Door, 8 Interior Doors, Epoxy Garage Floor, 2 Faux Wood Blinds on Every Window and Fans in Every Room. Convenient to the Crosstown Express (1 mile), I-75, MacDill AFB & Downtown Tampa. LESS THAN 1 YEAR NEW HOME with TONS of UPGRADES! ***AGENTS READ REALTOR REMARKS.